These are a U.K. size 4 (a US 6). “Dr Martens” is also embossed into the leather on each shoe. I wore these once, so they show almost no evidence of wear. No one should notice this unless they are sitting at your feet! Platforms Ankle Boots Vintage Burgundy size 6 70s 80s glam rock. Condition is Used. Some scratches and marks. Very comfortable when on. The colour is burgundy but strangely it looks brownish on photos. I am open to offers. Dispatched with Royal Mail 1st Class. Heel to Toe on the Sole is 8 3/4". They will fit smaller and more narrow. Heel height is 3 1/2". Pretty red 1940s peep toe heels. They are a modern size 8 and have a few flaws (pictures shown). I bought these and only wore them once, but they're still wearable. Sold as is. 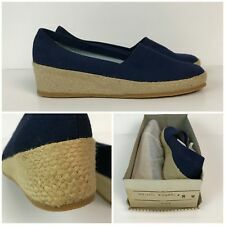 Measurements Insole: 10" Width (bottom of the foot): 3 1/16" Insole width: 3" Heel height: 3"
Great Condition with Minimal Wear. SILKY SUEDE. Original box, it is in used condition, with two small holes on the side of the lid and lots of creasing. The original label is still on the front which reads~. MADE IN ENGLAND. (this has been written by hand in biro) £7.50. Even the laces are strong. Black leather with grey-green suede upper. Long narrow foot, typical of the era. CARRYING THE SIGNATURE OF CHRISTIAN VERMONET THESE ARE A REAL AMAZING PAIR OF RETRO SHOES. EL GRECO DONUT SHOES IN CINNAMON COLOUR. Bottom from toe to heel: 9". Heel height: 2". Fair antique condition. See photos. Width: 2 7/8" across at widest part of sole. Calf Opening Circumference at Rest: 11in. Signs of normal wear to the heel and toe areas. Elastic side lace-up. Label is dunham eskipettes. Rise from Bottom of Heel: 14in. Width at Widest Point: 2.75in. 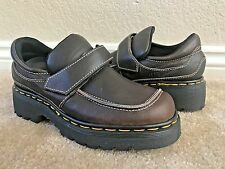 Size 7 Mary Janes! Super cute and add a fun flair to any look! They have a few little scuffs on them, but they are in very good condition and are very durable and comfortable. RARE FIND! 1920’s pair of Edwardian leather shoes made by DUTTENHOFER out of Cincinnati. They appear to have hardly been worn. This company was a high end shoe maker of the time. The workmanship is exquisite. They have some scuffs and the interior of the shoe is starting to disintegrate. They would be great for display but I would not recommend wearing them. They are almost 100 years old! Please check my other listings for more vintage items. I am happy to answer any questions. I do not except returns. Thank you for your interest. Brand new in box. These are amazing. 1940s/ style leather tooled mexican platform wedges. Never worn. From vender in California. Handmade item. are comfy. Size 7m to 7.5. Measure a little over 9.5 and med width. Just beautiful. A little deeper red than pics. Not as bright. Enhanced a bit. Please go by measurements. This is estimated sizing. Beautifully made. Leather sole. True to vintage originals. By Clarks (reproductions). semi-pointed toes, Louis shape heels. rubber soles, authentic look. Size 4.5uk. Detail in frontand they close with a silver tone buckle. They are black satin, including the heels. There is a pretty light green leather trim. Approximate 9 7/8" insole length. Approximate 1 7/8" heel. Lace Up Hiking Boots. Leather & Canvas. Heel Height→ 7/8". Inside Footbed Length→ 10". Boot Height→ 5 1/2". Sole Width→ 3 3/4". Preowned item. May show signs of wear. See pics for condition. Please contact me for questions or additional photos prior to purchasing. Shipping price is for continental US only. Otherwise use GSP. WILL SHIP QUICKLY AND SAFELY! Thank you!! These ankle boots have a side zipper with giant o-ring pulls. They look so mod and are perfect! Heel height of 3”. One of the zippers is a little grumpy but it does work. Excellent used condition. The bottoms are also dirty, however the rest of the shoe is excellent. Original 1950's "Baby Doll" pump. Good condition - have been worn, but not abused. Sweet little shoes. Toe to heel inside along footbed is 9 1 / 4 ". Size is not legible in shoe. I am guessing they are a 5-5 1/2. Rubber soles. The slippers have had a little wear but the soles look in barely worn condition. There is a little wear to the lurex on the edge of the left mule near the back. “Like totally” cute pumps. Estimate circa 1980s (possibly early 90s). All pics are of the same one pair of shoes. See all 12 pics for details $ enlarge each pic for a closer look. Lots of life left. See the heels & sole. Any wear, scratching, threads (see the edge of top front part of shoes) or anything else is to be considered character. Size 8 M (please be aware that vintage sizes can run differently or smaller than modern day sizes). Shoes are is which is as pictured (and just as they were found). Sourced in/from California. Shoes only. No box. Leather upper, gorgeous violet suede and leather sole. Vintage Pied Pieper “1960’s-1950’s” Blue/White Saddle Oxfords Sz 9.5 AAA Pre-Owned. Shipped with USPS Priority Mail. Beaux souliers époque 1920 30. en velours noir et interieur cuir. Here we have the Marianne From Modshoes. The leathers are super soft and require very little wearing in. This style has been developed from an original pair of 1960s shoes. “These are beautiful shoes. Era: 1910s to early 1920s. Beautiful antique pointed toe black leather lace up oxfords. The outsole on these is beautiful. A little on the thicker side, all black, stamped "La France shoe", and with a smooth curved heel. Stunning New and Unworn Late 60's / 70's Shoes from Bective. Fashioned in Leather & a velvety suede, beautifully detailed enlarge photos to see. In New and unworn condition which makes them pretty rare. Vintage 1991 Reebok AXT Low Trainers Size women’s Uk 5 US 7 Eu 38 Never worn . These are new old stock , very rare dead stock - they have never been worn . They have the original box . They are in excellent condition. There are some slight signs of storage and yellowing on the sole but still great shoe for Vintage Reebok classic collectors etc and wearable . I will post fully tracked & insured for fee domestically , overseas please contact me for accurate shipping costs. Please see my other vintage items with more to follow ! Dr Martens Made in England Vintage Brown Lace up Shoes Oxfords UK 5 US 6 6.5?